The Pleasures of Hope, with other poems. A new edition. [with]: Gertrude of Wyoming, and other poems. Ninth edition. London:: Longman, Hurst, Rees, Orme, Brown, and Green, 1825., 1825. 2 vols. in 1. 12mo. 144; 160 pp. Engraved half-title, engraved plates by C. Heath after drawings by R. Westall. Original full dark green straight-grain gilt-ruled morocco, gilt spine, a.e.g. ; neatly rebacked to match. Early bookplate of J. 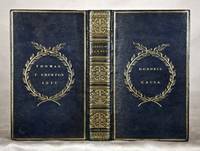 B. Winterbotham; inscribed "Thate B. Winterbotham a relic of other days, Xmas 1862 - J. B. W. to Ms. P. Batten, Nov. 1826." [John Brend Winterbotham, 1805-1881]. Doheny copy. Near fine. 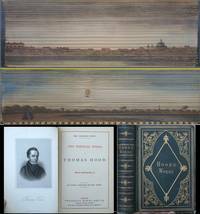 With a beautiful fore-edge painting of Eton [unlabeled]. There is no bookplate, but this book was part of the Doheny collection. From the Estelle Doheny Fore-edge Painting collection, with her inventory number in the rear. Provenance: John Brend Winterbotham (thru 1862) - Maggs sold to Doheny in 1951. See: Catalogue of Book and Manuscripts in the Estelle Doheny Collection, Part III, Los Angeles, 1955, p. 87 - Jeff Weber Rare Books, Catalogue 1, item 6 - Mrs. Gladys McKenney Molony - gifted to the Saint Mary's-of-the-Woods College Library (sold 2007). See: Norman's History of Cheltenham, by John Goding - Cheltenham (England), 1863, p. 653, citing J. B. Winterbotham. [John Brend Winterbotham, whose wife was Mary Brend-Winterbotham (m. 1828)]. The Law Times, March 12, 1881, p. 340. Title: The Pleasures of Hope, with other poems. A new edition. [with]: Gertrude of Wyoming, and other poems. Ninth edition. Publisher: Longman, Hurst, Rees, Orme, Brown, and Green, 1825.